Property 2: 1ST FLOOR APT WITH PRIVATE ENTRANCE, WINTER: HOT TUB, FIRE PIT, HIKING! Property 7: Renovated 1 BR getaway 1 block from Mystic River in Historic downtown! Property 18: Cozy Summer rental!! Property 23: Unique, refined-rustic suite in Stony Creek village. 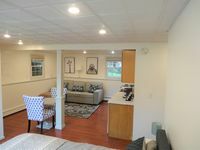 Property 24: Pet-Friendly Branford Home - 10Min Walk to Beach! Property 25: Seaside Getaway! Short walk to town and 180degrees of ocean views. Property 27: Luxuriously Renovated Retreat in Downtown Mystic With River Views! Property 33: In-Town, 2 Bdroom! Tidal Marsh Views, 10 Minute Walk to Beach! Property 38: Stonington Borough first floor one bedroom furnished apartment. Property 42: Great Mystic, Ct. Location! This studio is very comfortable, in a great neighborhood and close to many of the area attractions. The owner is very responsive to questions. We would absolutely stay again.